The American chestnut, a native tree commonly found in the Eastern Deciduous Forest at the beginning of the 20th Century, was virtually exterminated by the early 1950’s. The species’ demise resulted from a stem fungus blight accidentally introduced from northern China. 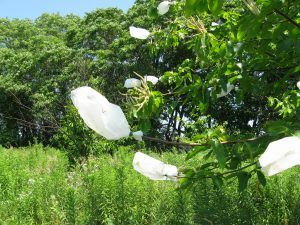 Since that time, plant geneticists have been working to breed a tree that is resistant to the blight, and a recently developed strain appears to be resistant. Bill Minter, Director of Land Management, is cooperating on this project with the Indiana Chapter of the American Chestnut Foundation and the Purdue University Hardwood Tree Improvement Center. Merry Lea is one of 3 sites in Indiana that was selected to grow and screen specimens that represent the Indiana ecotype of the blight-resistant strain. 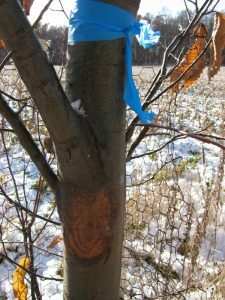 In 2001, Minter planted 211 seeds that represented four families of parent trees from Indiana that were cross-bred with selected disease-resistant Chinese chestnut. In 2008, these trees, which represented 15/16th pure American chestnut, were inoculated with the blight. 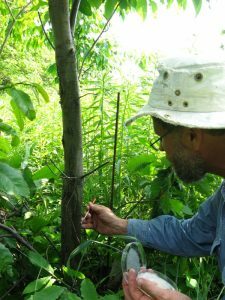 In 2010, trees that showed best resistance to the blight were selected by staff from Purdue University’s Hardwood Tree Improvement and Regeneration Center and backcrossed once again with American chestnut trees representing their respective families of origin. 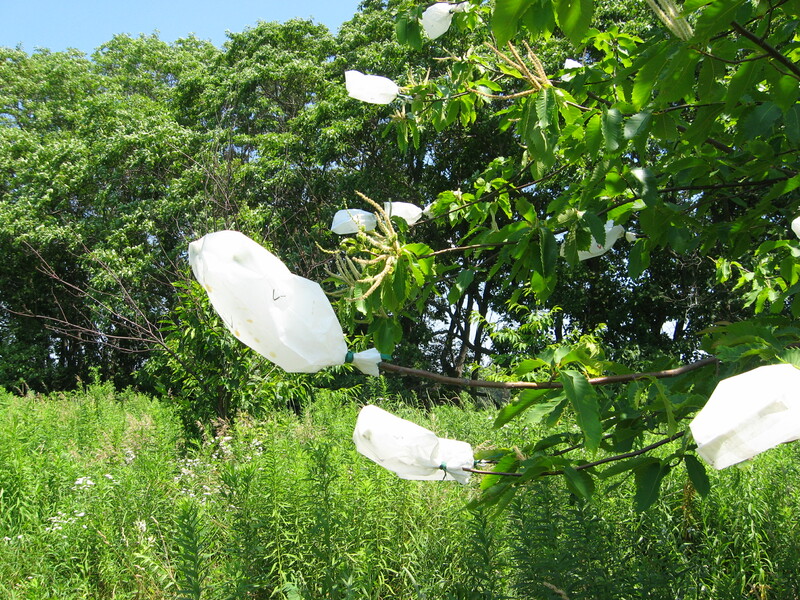 The offspring of this third backcross (BC3-F3) were used, with those from the two other sites in northern Indiana, to establish a seed orchard near South Bend, Ind. these seedlings representing the northern Indiana ecotype will be evaluated over the years for blight resistance, with hopes of ultimately having blight resistant American chestnut seedlings available to the public through the IDNR State Nursery by 2030. Merry Lea’s involvement also serves its educational mission. Over the years, undergraduate students and the public have been able to observe real-time research in using genetics to solve a significant environmental problem. Inoculant plug for chestnut trees. 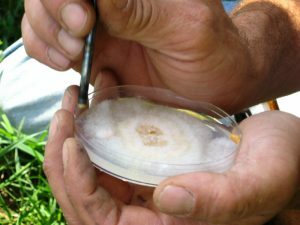 Lab-cultured chestnut blight inoculate is placed in a cavity that was made in the stem with an awl punch. Uncontrolled Infection: Inoculated trees were inspected and rated for their response to blight infection in December 2008. This tree shows poor resistance response. A callous ridge has not formed around the infection site. 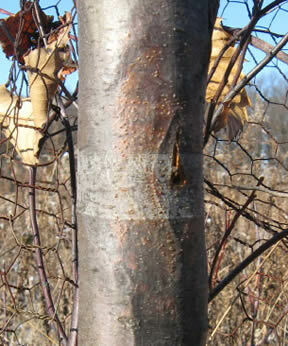 Controlled infection: This American Chestnut shows good resistance response. An elliptical callous ridge has formed and is stopping the infection from spreading around the stem and thus girdling and killing it. In 1972, Lindsey established permanent plots in the oak-hickory forest on the west side of Merry Lea. He measured the diameter of every tree in each plot. The surface area in a cross section of each tree could then be determined. This measurement is known as the basal area, and the total area of all the trees along the line will give an aggregate, basal area for the growth in that location. In 1982, Lindsey called on Goshen College student Steve Yoder to repeat the study. 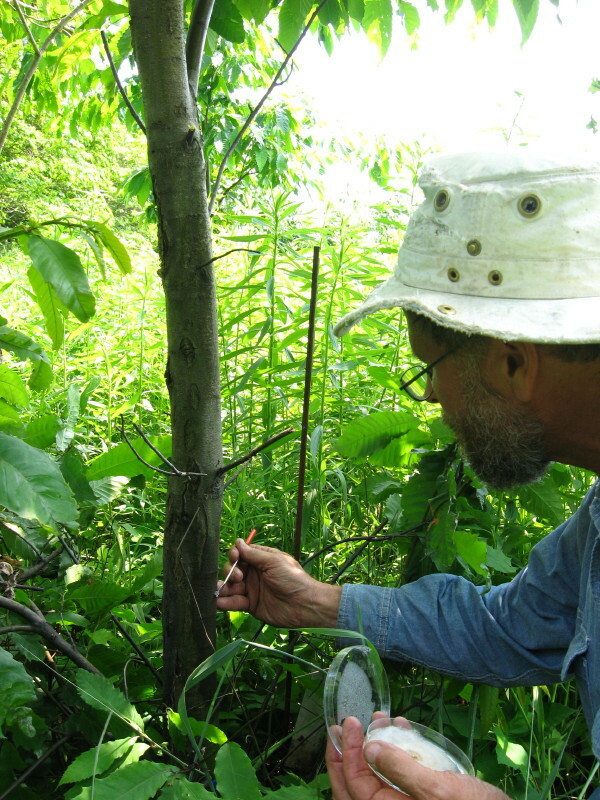 With the help of a grant from the Indiana Academy of Science, Yoder located Lindsey’s transects and carefully repeated the measurements. From his measurements Yoder could determine how much wood had been added during the decade. In 1992, Dr. Mary Linton and her students again conducted the study, and they compared the amount of wood added in the first decade of the study with that of the most recent ten years. The rate of wood growth was about the same. During the winter of 2002, Goshen students Rachel Jackson and Jolyn Rodman measured the woodland for the fourth time. They worked under the direction of Eric Nord, 2002 Lindsey Fellow, a position named in honor of Dr. Lindsey. The research team measured and tagged nearly 600 trees during the course of their work.According to Nord, such a project “takes the pulse” of the same place over a long period and establishes an invaluable base line. Re-measurement occurred again in 2012.